This morning, a 17-year-old Palestinian terrorist stabbed and murdered a 13-year-old Israeli girl, Hallel Yaffa Ariel, while she slept in her bed. The Palestinian terrorist Muhammad Taraireh, who entered the girl’s home in Kiryat Arba near Hebron, also injured an Israeli security official before he was shot and killed. 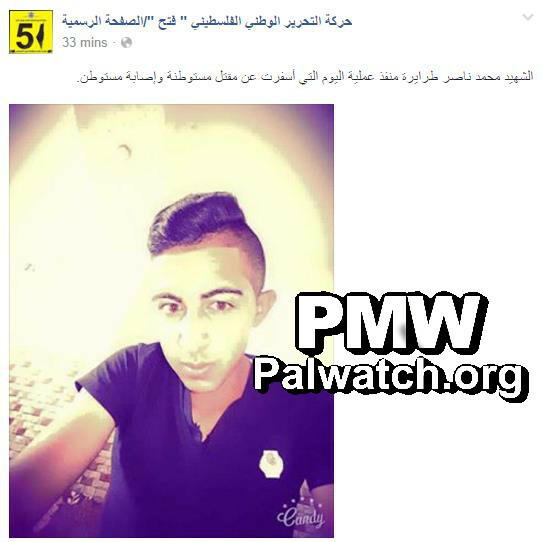 Fatah’s official Facebook page immediately posted his picture, declaring him a Martyr - “Shahid,” the highest honor achievable in Islam according to the Palestinian Authority.